Brad Nix: Bio & Choral Music | Santa Barbara Music Publishing, Inc.
Brad Nix (b. 1975) serves as Associate Professor of Piano and Chair of the Music Department at Sterling College, located in Sterling, KS. He received the Doctor of Musical Arts degree in Piano Performance from the University of Colorado at Boulder. His primary teachers include Andrew Cooperstock, Geoffrey Haydon, Barbara Lister-Sink, and David Watkins. 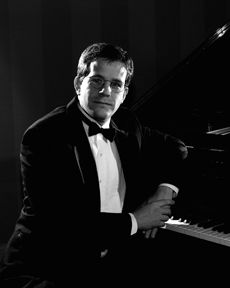 Dr. Nix is an active recitalist, pedagogue, and freelance pianist, and he makes frequent appearances as an adjudicator for local and statewide piano competitions. He has several pieces published, and studies composition with Mark Hayes. Brad Nix has 2 titles published with Santa Barbara.